The Bunny Bungalow: Happy New Year! My drawing, after an 18th century terracotta cherub at the Metropolitan Museum of Art, New York. This is a scan of a New Year card (updated via Picasa 3) that I made and sent to close friends and relatives one year. 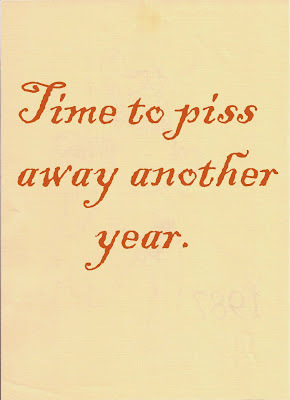 Some telephoned to explain that they hadn't pissed away last year; some got the humor; some telephoned to promise that they wouldn't piss away the New Year. Some just got pissed!